Isadore Navarre has many notable ancestors, including kings, emperors, dukes, counts, etc., as well as many prominent figures in the establishment of French Canada and Wisconsin. All of that will be the subject of other articles. Today I would like to mention some of the known living celebrities whom Izzy claims as cousins. 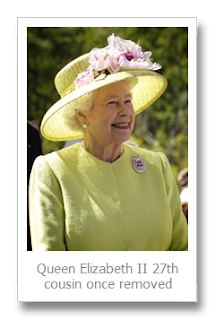 It may come as a surprise to some that Izzy, with this strong French background, claims as cousins Queen Elizabeth II of the United Kingdom who is married to Duke Philip of Edinburgh. Their son, Prince Charles of Wales who married Princess Diana, married Duchess Camilla of Cornwall, who is also a cousin of Izzy. She is also the mother-in-law of Duchess Camilla of Cornwall who is Izzy’s 9th cousin, once removed. 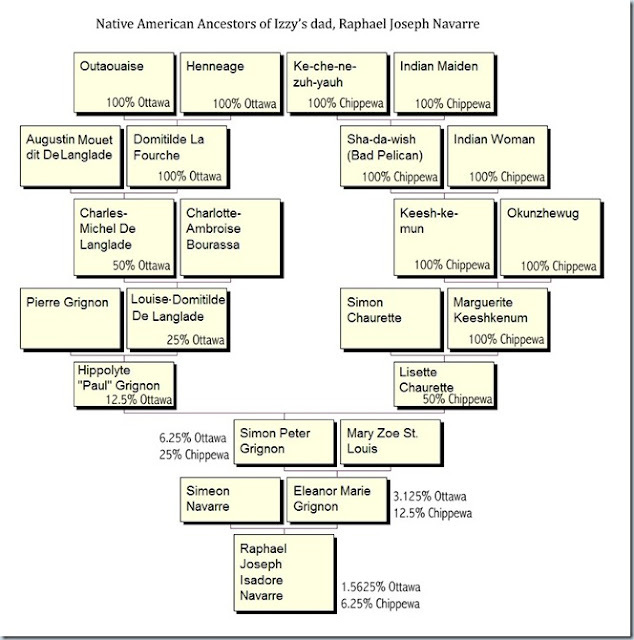 The answer: Isadore Joseph Navarre had ten known ancestors who were full-blood American Indians. Three of them were Ottawa, six were Chippewa (Ojibwe) and one was Menomonee. 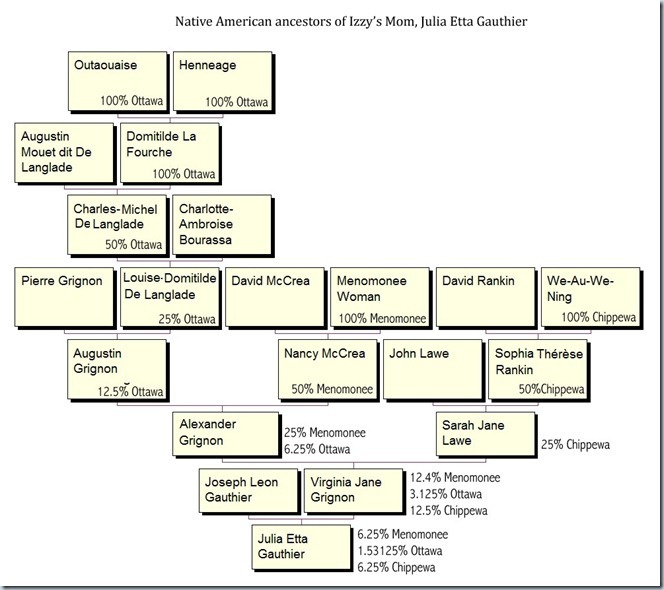 Izzy was almost 11% Indian – about 3.25% Menomonee, 6.25% Chippewa and about 1.5% Ottawa. His wife, Olive Sarzycki Navarre had no known Indian ancestors so his children can claim half of these percentages – about 5% Indian. Izzy’s Indian heritage came from his Grignon ancestors. His grandmother on his mother’s side, Virginia Jane Grignon, was more than 28% Indian from the Menomonee, Chippewa and Ottawa tribes. His grandmother on his father’s side, Eleanor Marie Grignon was almost 15% Indian from the Chippewa and Ottawa tribes. The charts below give specific information about his mother and father’s Indian ancestors. Both of his Grignon grandmothers descended from Charles de Langlade, a famous Wisconsin pioneer whose father married the daughter of the influential Chief Outaouaise who lived near Fort Michilimackinac which was located at the location of present-day Mackinaw City, Michigan. We’ll discuss Charles de Langlade and Chief Outaouaise in later blogs. Izzy’s 2nd great-grandmothers, Nancy McCrea, Sophia Therese Rankin and Lisette Chaurette, were each 50% Indians. 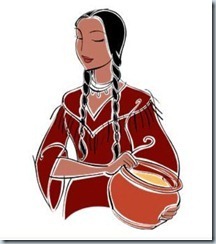 Nancy’s mother was a full-blooded Menomonee and both Sophia’s and Lisette’s mothers were full-blooded Chippewa. It was a fairly common practice in those days (18th century) for the French fur traders and other businessmen to marry into influential Indian families. 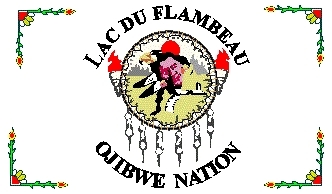 One of Izzy’s ancestors was the celebrated Keeshkenum, head Chief of the Lac du Flambeau band of Ojibwe (Chippewa). I hope to discuss him at greater length in another blog. 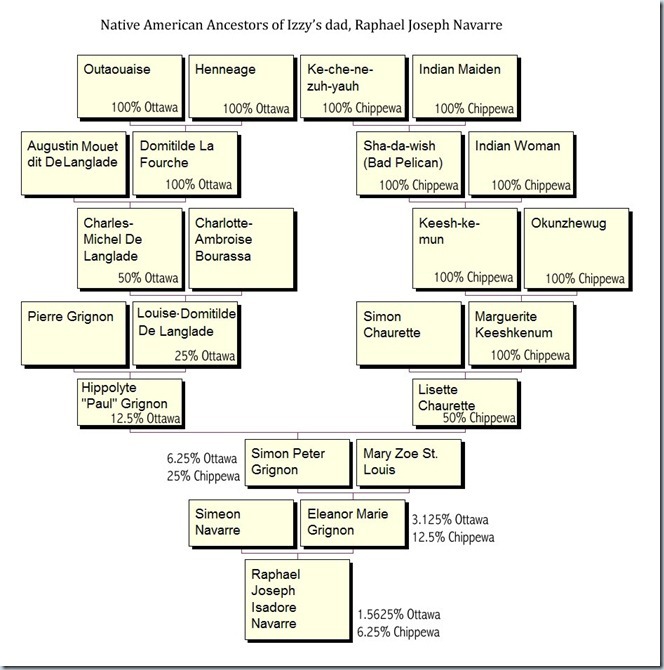 One of the most notable of Izzy Navarre’s grandparents was Chief Keesh-ke-mun, called by the French "La Pierre a’ affiler" or "Sharpened Stone." He was the celebrated chief of the Lac du Flambeau band of Ojibwe Indians (also known as Ojibwa, Ojibway, Chippewa or Chippeway). He was Izzy’s 4th great-grandfather. In 1671 the French held a great convocation of tribes at Sault Ste. Marie and tradition has it that Ke-che-ne-zuh-yauh (Keesh-ke-mum’s grandfather), the head of their family, was recognized as principal chief over the Ojibway tribe. A gold medal shaped like a heart was placed on the breast of Ke-che-ne-zuh-yauh, and by this mark of honor he was recognized as the chief of the Lake Superior Ojibways. On his death this gold medal was buried with him, through the notion that he should appear in the land of the spirits with the same honors which had attended him on earth. His grave was located on the shores of Shag-a-waum-ik-ong Bay. In 1850 it was carefully searched for by some of his descendants to recover the medal, but the grave was found to have been swept away by high water. In the early 1700′s the Ojibways took possession of the head-waters of the Wisconsin River after extensive battles with their hated enemies, the Dakotas. The pioneer chieftain of this extensive district of country, was named Sha-da-wish (Bad Pelican), Keesh-ke-mun’s father. The French early designated that portion of the tribe who occupied the head-waters of the Wisconsin, as the Lac du Flambeau band since they located their central village or summer residence at the lake known by this name. The Ojibways term it Wauswag-im-ing (Lake of Torches), from the custom of spearing fish by torch-light, early practiced by the hunters of their tribe who first took possession of it. Before eventually permanently locating their village at this lake, the Ojibways, under their leader, Sha-da-wish, made protracted stands at Trout Lake and Turtle Portage, and it was not till the times of his successor and son, Keesh-ke-mun, that this band proceeded as far west as Lac du Flambeau about 1745. The area has remained a permanent Ojibwe (Chippewa) settlement ever since. 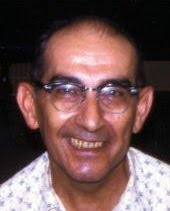 This blog is intended to help us appreciate the rich and colorful heritage of Isadore Joseph Navarre (1910-1975).